The Boom Brothers takes you on a great mining adventure in this video slot machine from Net Entertainment. You can bet on 20 lines over 5 reels. The Boom Brothers slot machine has several extra features such as the free spin, railtrack and 2nd chance features where you can earn a lot of extra cash. This video slot from Net Entertainment has a very comic theme, filled with a lot of fun characters that pop-out from the reels. The overall impression is a great; Boom Brothers delivers a fun and exciting video slot where the theme is presented in the great design of this game. Once again, Net Entertainment has developed a great high class video slot that really brings out the fun of spinning the reels. 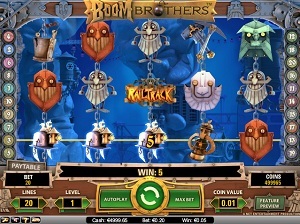 Boom Brothers takes you on the adventure where you get the chance to win your fortune somewhere deep underground. Net Entertainment sets a very high standard in their ever so popular video slots. Boom Brothers is not the exception that proves the rule; this slot is great to watch, to listen to but most of all – to play. The colouring of this slot is deep blue and this serves as a great contrast to the colourful symbols that you’ll see on the reels. All symbols are very detailed and the game window is filled with a lot of cool objects. The sound and the music are very cartoon-ish and it brings a very fun feel to the game in combination with the design. Boom Brothers is a 100% great gaming experience that surely will entertain you. There are no card deck symbols in this slot machine. All symbols are themed related. You will see a lot of different mining tools as symbols; the rock hammers, oil lamps and mining buckets. There are also three different mining locomotives that each represents a Boom Brother that will pop-out in certain winning combinations. The wild is the bomb symbol and it will substitute for all other symbols except for the free spin and bonus symbol. The free spin symbol is just a logo that says Free Spins. This will trigger the free spin feature if you hit three or more on the reels. The bonus symbol is the Railtrack symbol. Three of this symbol will open the bonus feature. The free spin feature is triggered once you have managed to get 3 or more free spin symbols on the reels. The free spins has a X3 multiplier and you will get more free spins added to the feature if you hit more free spin symbols during the feature. The railtrack feature is triggered if you hit three or more railtrack symbols on the reels. This feature will take you to a new game window where you will have to reveal your prize by picking the railtrack cars. This feature is very entertaining and can boost your gaming balance a lot. The 2nd chance feature is triggered randomly and will activate a pop-up symbol that will change some symbols on the reels and if you get lucky you will end up with a winning combination. Boom Brothers has 5 reels where you may bet on as many as 20 pay lines. Your maximum bet per line is 1 coin but you may bet as low as 0.01 coins per line. Boom Brothers has a very neat auto play function which is activated by clicking on the Auto button. You will then be able to set your auto play preference from a options menu.